Nearing 10 Years of Dividend Increases, Are These 3 Stocks a Buy? 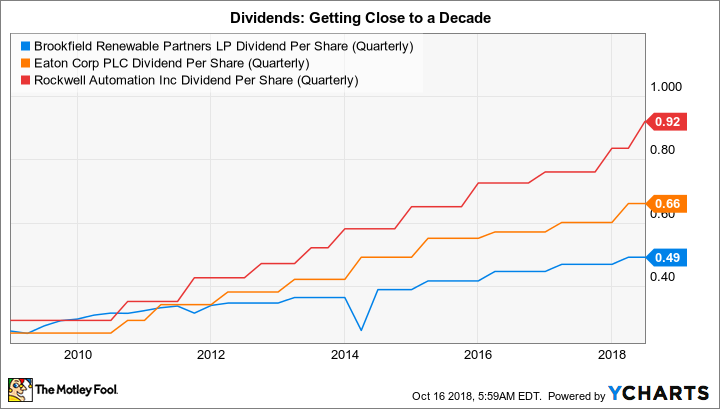 These three companies are all close to hitting a key dividend milestone, but does that make their stocks worth buying? It's impressive when a company increases its dividend every year for 10 consecutive years. It shows a commitment to rewarding shareholders with a tangible cash return on their investment. Brookfield Renewable Partners L.P. (NYSE:BEP), Eaton Corporation plc (NYSE:ETN), and Rockwell Automation Inc. (NYSE:ROK) are all about to hit the decade mark with dividend increases. But does that make any of them worth buying? Brookfield Renewable Partners has nine years of annual dividend increases under its belt, and currently yields a generous 6.7%. The master limited partnership is run by Canadian money manager Brookfield Asset Management and owns, as its name implies, renewable power assets. However, it's important to note that Brookfield Renewable Partners is designed to be an actively managed portfolio, in which renewable power facilities are bought and sold over time. The core of Brookfield Renewable Partners' portfolio is hydroelectric power, which accounts for around 80% of its funds from operations. The partnership uses this foundation to expand into other areas like solar and wind. The portfolio, meanwhile, is spread across the globe, with renewable assets in 10 countries. Notable recent acquisitions include an investment in TerraForm Power and the purchase of TerraForm Global, moves that vastly expanded the partnership's reach outside of the hydro sector. Brookfield Renewable Partners believes it can grow funds from operations by 6% to 11% a year. Underpinning that is inflation escalators in its power contracts, margin expansion from cost cutting and efficiency efforts, and capital investments, including acquisitions and ground up construction. The target growth rate for the distribution is 5% to 9%, a range that it has achieved over the trailing 1-, 3-, and 5-year periods. With an investment grade balance sheet, Brookfield Renewable Partners is a solid option for income investors looking to buy a renewable power company. After a strong price advance, Eaton Corp's stock has fallen around 10% from recent highs. That's left it basically breakeven on the year, and a much better value than it was just a month or so ago. That said, Eaton appears to be reasonably valued at this point, with its price to earnings ratio below its five-year average and those of its peers (using the Vanguard Industrials Index Fund ETF as a benchmark) and price to cash flow, price to book value, and price to sales all roughly in line with historical averages and the benchmark. 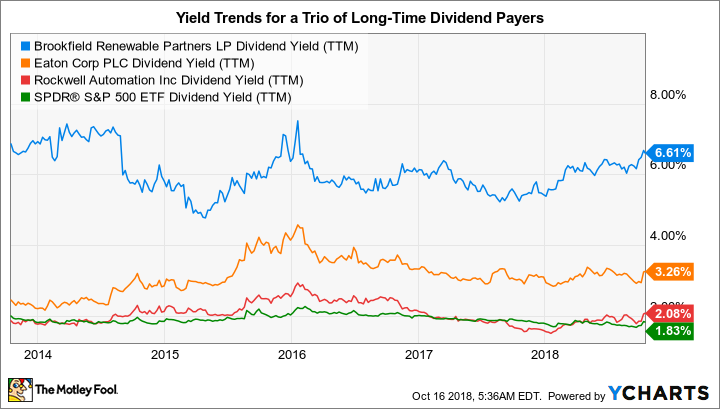 The current dividend yield is roughly 3.3%, and that dividend has been increased at an annualized 10% over the past decade. The industrial company focuses on helping customers make efficient use of power across the electrical, aviation, vehicle, and hydraulic spaces. Eaton is forecasting several years of market growth ahead, and believes that 13 out of 16 of its core end markets are in the early to mid stages of their business cycles. Although hardly a screaming buy, Eaton appears fairly priced, still appears to have a reasonably strong outlook for its underlying business, and offers a yield that's well above what you would get from an S&P 500 Index fund. It's worth a close look for growth and income investors. Rockwell Automation shares are down more than 10% this year. The yield is currently around 2.1%, just a touch above the broader market. Annualized dividend increases over the past decade have been roughly 10%. Unlike Eaton, Rockwell appears expensive across the board today, with its price to earnings ratio, price to sales, price to cash flow, and price to book value all above their five-year averages and the industrial peer group mean. Rockwell, as its name implies, is focused on helping industrial customers automate their businesses. Although that is an increasingly in-demand service as companies look to cut costs, Rockwell is a highly focused company in the cyclical industrial sector. It has been performing well of late, raising full-year earnings guidance in the fiscal third quarter, but the markets appear to have recognized that strength. Most investors are probably better off waiting for a larger pullback before jumping in here. Brookfield Renewable Power and Eaton Corp both appear attractive for income investors today. Rockwell Automation's business is performing well right now, but it looks like investors are well aware of that strength despite recent price declines. All three of these companies are well run and deserve to be watched as they close in on a decade of annual dividend increases, but only two should be considered for your buy list today -- even though the third, Rockwell, still deserves a spot on your wish list.